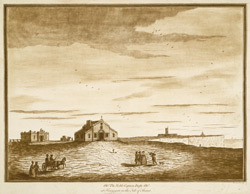 View showing some buildings on the coast at Kingsgate Bay in the Isle of Thanet, Kent. Lord Holland, father of Charles Fox had built a house here in the 1760s and also a number of follies nearby. To the north of his house is The Captain Digby Inn, which dates from the late 18th century and was built on the Bede's House. In this picture, to the left is one of Lord Holland's follies, the Arx Ruohim, a ruined coastal fort in the style of the time of Henry VIII.